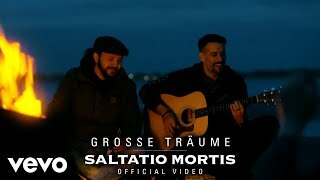 Out of the studio, straight to Greenfield Festival – welcome back, Saltatio Mortis! Their new record “Brot und Spiele” (release August 2018) guarantees new hits in the live set of the band from Karlsruhe, songs that touch, excite and move you. Saltatio Mortis’ sole purpose isn’t just to entertain. They want to be a thorn in the ear. Feel-good-vibes and cuddle attacks? Not happening. Saltatio Mortis still refuse to sit around quietly and will bravely stand up to express their opinion. Knowingly so, the band takes up controversial and difficult topics, never being bold and simple, but authentic and contemporary.